My name is Kelly, and I am a peach hoarder. No, really! I love peaches as you may well know. Last year – as peach season came to a close – I got a bulk package of dry peaches to get me though the winter. I love them because they are sweet, chewy, and terribly versatile. I may have gone a little over-board, however, in the amount purchased. Despite the fact that I dice them up and toss them into my morning oatmeal, rehydrate them in whiskey or brandy and toss them into muffins, or just nibble them as is, I still have quite a bit left. 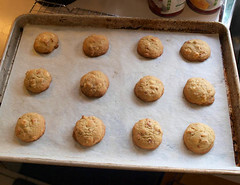 While contemplating new ways to use these peaches I came across a date pecan cookie recipe from my great-grandmother. I was never fond of these cookies because they are too fluffy and a tad dry. 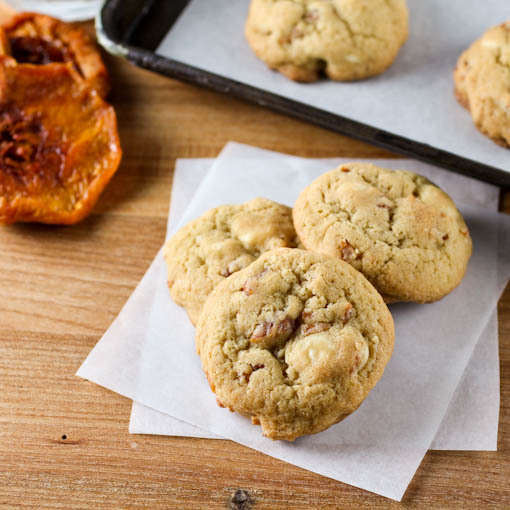 Could I make these cookies better, and with peaches? After taking apart the old recipe I made some changes. I swapped shortening for real butter, I traded some of the white sugar for brown sugar, I upped the vanilla by a teaspoon, reduced the flour, and changed the way the cookies were mixed and baked. Oh, and I traded dates for peaches, and pecans for white chocolate chips. Whew! 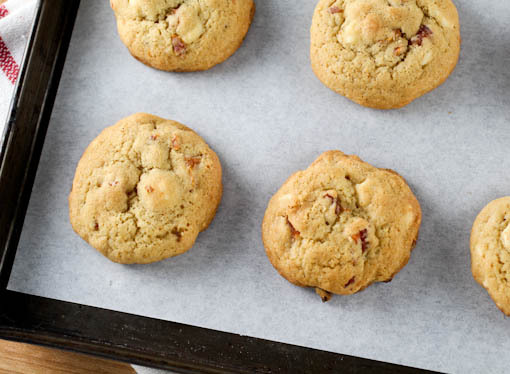 The resulting cookie is chewy, moist, and wonderfully peachy! When baking these I would err on the side of under-baked to help them stay chewy in the center and moist. Like any cookie, 30 seconds can often make the difference between a perfect cookie and a disappointing cookie. 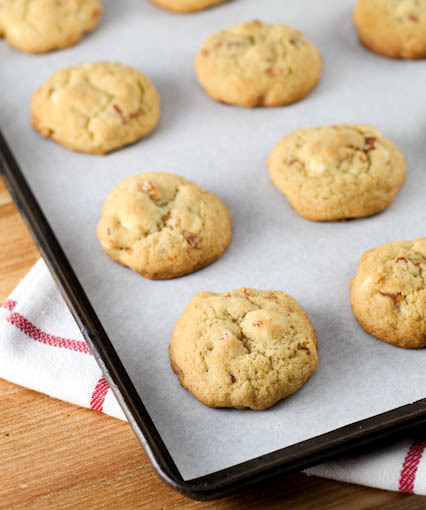 If you can’t find dry peaches, and you do not want to order them online for one cookie recipe, you could substitute dry apricots, mango, cranberries, raisins, or dates. 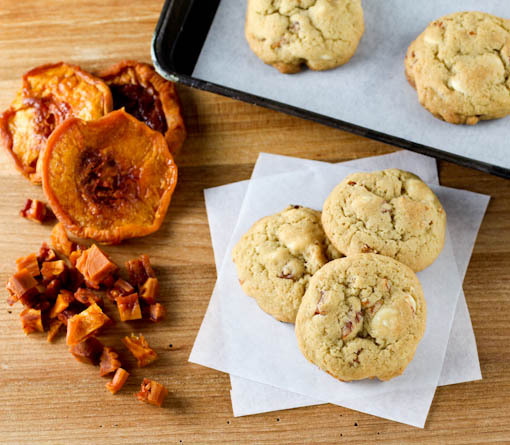 Just be sure to finely chop your dried fruit of choice for even distribution throughout the cookies. These keep for three days in an air-tight container, and they freeze beautifully for longer storage. 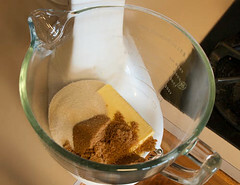 In the work bowl of a stand mixer fitted with the paddle attachment, or in a large bowl with a hand mixer, add the butter, brown sugar, and sugar. Beat on medium low speed until thoroughly combined but not fluffy, about 30 seconds. 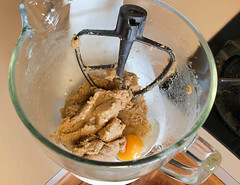 Add the eggs one at a time, mixing until each egg is well combined before adding the next, about 20 seconds each. Add the vanilla and mix to combine, about 10 seconds. 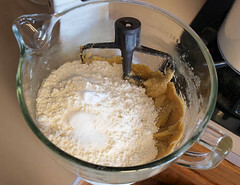 In a separate bowl combine the flour, baking soda, and salt and whisk to combine. 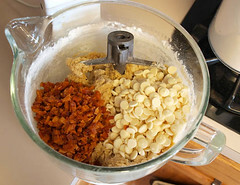 Add the dry ingredients into the butter mixture and mix on low speed until just combined, about 10 seconds. Add the white chocolate chips and the diced peaches and mix on low until thoroughly distributed, about 10 seconds. 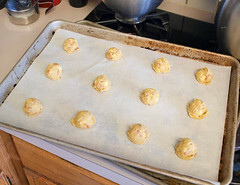 Scoop the cookie dough by rounded tablespoons onto the prepared baking sheets. Bake for 8 -10 minutes, or until the cookies are just golden brown on the edges and the tops are lightly golden but not deeply browned. Cool on the pan for 5 minutes before transferring to a cooling rack to cool completely. © 2013 – 2015, Evil Shenanigans. All rights reserved.